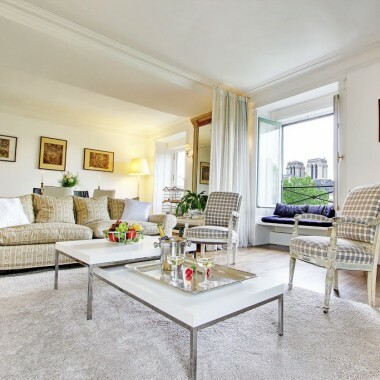 This elegant rental apartment is situated in the charming and very popular Marais area, steeped in history, as well as offering a wonderful choice of boutiques, restaurants and cafés. 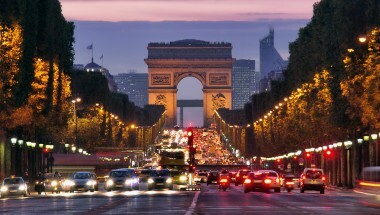 It is situated very close to the main street, the Rue des Francs Bourgeois, and the exquisite Place des Vosges. The apartment (65m2) is on the fifth floor of a building with lift access. Entrance is into a small corridor with beautiful reproductions of art setting the tone, including paintings by Frank Stella and Aki Kuroda. To the left of the entrance is the fully equipped kitchen area, with beautiful wooden kitchen tops. In front of the entrance is the sitting area, and to the right, behind a wall, the dining room. White is the dominant theme here, giving a luxurious minimalist and contemporary feel, with white ceiling mouldings, curtains, sofa, antique armchairs, dining room chairs, and even the porcelain chandelier. Antique furniture, such as the Second Empire armchair and Louis XV armchairs are combined with contemporary furniture, such as Philippe Starck's lamp or the Mies van der Rohe coffee table. To the left, next to the kitchen corner, a small corridor, leads to the bedroom, bathroom and WC. The cosy bedroom features wallpaper patterned in luxuriant black and white foliage, a double bed (160 x 200m) and a black leather armchair. The bathroom has a shower cubicle with both a hand shower and large diameter overhead shower. 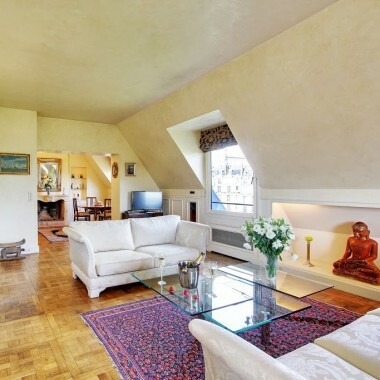 There is also a double sofa-bed (140 x 200m) in the living room to accommodate up to two extra guests. Amenities include TV, stereo system. Wi-Fi, dishwasher and hairdryer. 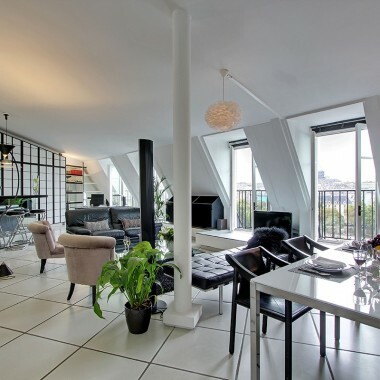 This elegant rental apartment is in a wonderful Marais location, very close to the popular Rue des Francs Bourgeois with its great shopping and dining options. It is also very close to the exquisite Place des Vosges.